Amore Manual Reclining Corner Sofa. 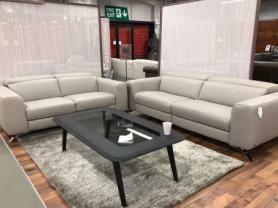 Upholstered in soft, hard wearing grey chenile fabric. Features manual recliners at each end and pocket sprung seats with high backs for ultimate comfort. Fantastic quality at a bargain price. Approximate Measurments: 240 cm x 240 cm. Depth; 100 cm.